NORTH LIBERTY, Iowa — Beto O'Rourke is running and so am I. Literally. 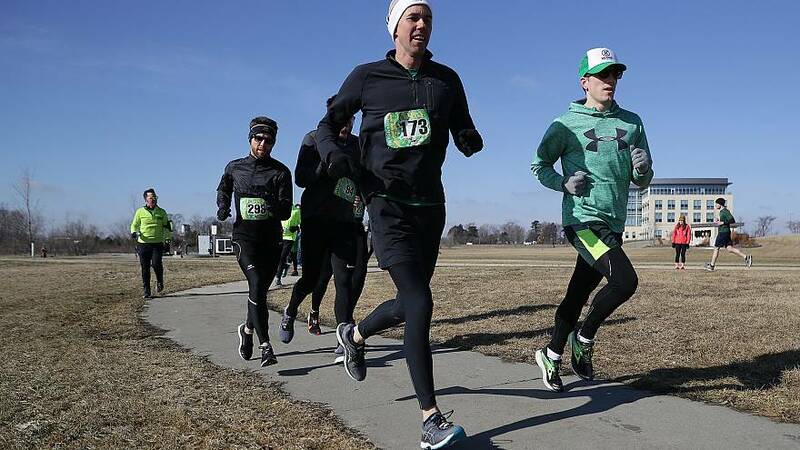 I'm trying to keep pace with the lanky Texan as he runs 7:48-minute miles and chats with other runners in a St. Patrick's Day 5K on Saturday. I'm eavesdropping and picking up snippets like "...back with my punk band..." and "...so I was on the Veterans Affairs Committee." At the finish line, the 46-year-old Democrat is greeted by more cameras and more voters with more questions, so he holds a sort of post-run press conference, seemingly unable to help himself in the midst of his first campaign swing in the first-in-the-nation caucus state of Iowa. He then climbs back behind the wheel of his rented Dodge Caravan to drive him and his staff to his next event, where he'll speak from the bed of a pickup truck and knock on doors (he found time to shower). O'Rourke will hit two more events before making it back to the hotel late that night. It's how Beto O'Rourke runs. And for O'Rourke, the way he runs may be just as important as what he's running for. "This pace and this manner of campaigning is not just perhaps the best way to win, it may the only way to serve if we're going to meet the challenges before us," he said after the race. "It's thrilling to me. It's really exciting. So that's where I find my energy." On his three-day trip through Iowa, O'Rourke campaigned much the way popular imagination envisions presidential candidates barnstorming. No Notes. No security. No barricades. No stages. No crowd control. No giant American flag backdrops. Just the candidate, a few aides, the minivan and their Facebook page to announce events. Before dawn on the morning of his launch on Thursday, I came downstairs of the Quality Inn in Keokuk, Iowa, to find its tiny lobby transformed into a makeshift campaign headquarters. 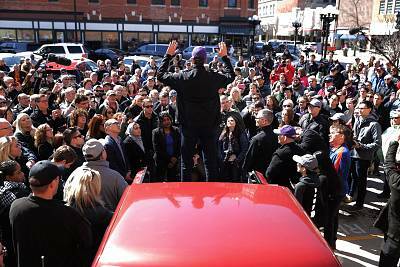 Over 837 miles in 15 towns, the candidate stood on coffee shop counters in Burlington, poured pints behind the bar in Mt. Vernon, and shook every hand at a sandwich shop in Fort Madison. This man loves standing on things. Iowans could talk to him. They could take a picture with him. They could touch him. They could, as one man whispered to a friend, even begin to smell him by the end of the day. He visited a record store, a skateboard shop and RAYGUN, the hip t-shirt place, switching between Spanish and English, between politics and music. He signed things — just "Beto." Simeon Talley, the co-host of the Political Party Live podcast, was trying to make sense of O'Rourke as he held two records the candidate brought as a gift (Santana's III and one by the Austin-based country group Asleep at the Wheel). "He might be the real deal — I think that's the question, right?" Talley said after an interview with O'Rourke. "I mean, he lost the Senate race, not a whole lot of resume, what has he really accomplished? But he might might be the real deal. He might be this generational talent that can really inspire the country in a special way. We'll see." O'Rourke's improvisational style means there may be no one around to warn him when he's coming across to some as a mansplainer. His wife, Amy, sat silently during his entire announcement video and then he kept joking in Iowa that she was raising the kids back in El Paso "sometimes with my help." People chuckled on the ground, but online the backlash was fierce and he apologized for "my ham-handed attempt to try to highlight the fact that Amy has the lion's share of the burden in our family." "I think the criticism is right on," O'Rourke said on the Political Party Live podcast. "Not only will I not say that again, but I'll be more thoughtful going forward in the way that I talk about our marriage, and also the way in which I acknowledge the truth of the criticism that I have enjoyed white privilege." It's hard to imagine the former congressman would be taken seriously at all were it not for Barack Obama, another "tall guy with a skinny resume," as Talley put it during his interview with the candidate. The Obama comparison is about the generational and political celebrity appeal, which can turn otherwise hard-headed Democrats a bit mushy. 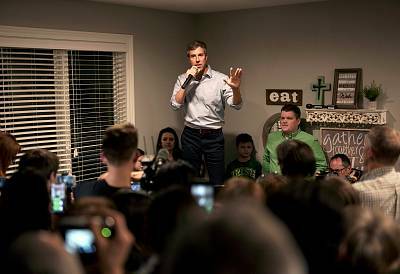 In Muscatine, a young woman stood on the porch of a Victorian home and watched through the window as O'Rourke spoke inside, waving his arms like he was conducting an orchestra. "My god, what a dreamboat," she said as her boyfriend looked a bit uncomfortable. "Save us, bae!" In Fort Madison, an older woman told me that meeting O'Rourke had broken the funk she'd been in since President Donald Trump's election. Leaning in, she confided that a fortune cookie had recently informed her that the answers to her prayers were coming soon. When a man in Washington nearly fainted a few feet from O'Rourke, someone in the crowd joked, "He has that effect on people." (The man was fine after some water and round of applause). How much gas in the tank? There's a reason many candidates don't campaign this way — the logistics are a nightmare. The tiny coffee shops filled so fast that people couldn't get in, the pickup truck placed the candidate conspicuously close to the rear end of a large bull statue, and a house party in Muscatine got so jammed with camera tripods and well-wishers that the owner joked his century-old home might collapse under the weight. And by the end of his third and final day here, O'Rourke's voice seemed to be fading — how long can he do this? "The answer to your question will be found in the weeks, the months, the years ahead," he said.